Products that claim to revert permed hair, and I'm not going to put them out there like that, will make your permed hair frizzy, and cannot make your permed hair turn natural. Nothing can make your permed hair turn natural, NOTHING at all. No product can do this. Besides, You do not want to put chemicals on top of chemically treated hair. You will only end up damaging the hair and get more breakage. Some folks try this method and mess up their whole thoughts and experience of going natural because chemical choices, or being a complete product junkie during their journey. Use natural hair products, and do your research. Find out your hair type with a little new growth, and work from there. Say NO to chemicals! While transitioning, try to find a style that will accommodate the new growth, like twists or braids, but make sure that what ever protective style you choose is soft on the scalp. No pulling or tugging on the hair or scalp. Remember, tight braids can damage the new growth before it even grows in, and can damage the scalp as well. Note: To find out your hair type. On this blog there is a tab area (above), click on "Hair Type Guide"! 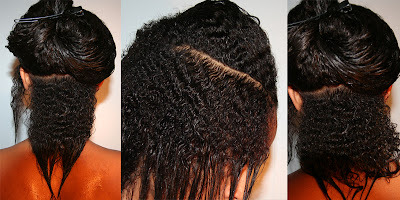 People often ask us how they can make their relaxed hair "revert" back to natural hair. The true answer is you cannot. Nothing will make hair that has been chemically relaxed go back to its natural state. You have two choices, you can live with the permed hair at the end of the natural hair that is coming in or you can cut the permed hair off. Should you decide you just can't let go of that length, be prepared for some breakage. The place where the natural hair joins the permed hair is a weak point. Many people experience a lot of breakage when growing out a perm. By treating the hair gently and minimizing combing during the transitioning stage, you can minimize the breakage. How much breakage you get is dependent on your hair type and how you treat your hair during the process. Baka Beautiful's Natural-Laxer MIX (I have not tried this product but read many great reviews -Natural Shren) is excellent for minimizing breakage during this phase. By gently softening the natural hair and strengthening the entire hair, the Natural-Laxer makes the transition from permed hair to natural hair easier and less traumatic. What ever you do, be beautiful, stay natural!!! So I hadn't had a relaxer in almost a year and a half (while pregnant and after) and got the "I can't take it anymore itch" and relaxed my hair in september 2014. Now,I am preggo again and decided this would be a grand time to try to transition again. So....any tips and encouragement would be GREAT!!!! Where do I even start? I was great at taking care of my relaxed hair but the natural hair journey got the COMPLETE best of me!!! !